Perdita Polar Bear is a super soft, squeaky fetch and retrieve plush dog toy from the new "Snow Mates" range from Animal Instincts. This soft comfort toy is great for your dog to snuggle up to. It is made from a premium, extra soft fabric and includes a squeaker for maximum entertainment. 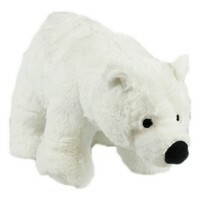 As well as snuggling, Perdita Polar Bear is ideal for playing, fetching, chewing and tugging. I bought this toy for my 14 week old puppy. She loves it and plays with it every day and it's all still intact. Would highly recommend. A lovely soft toy for puppies god for fech and retrieving and to snuggle up with.